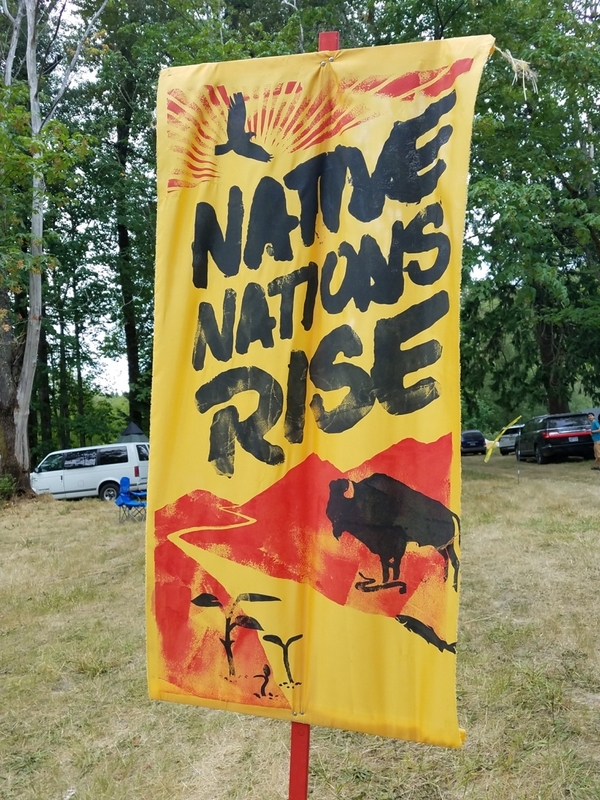 Hosted by the LSqualli-Absch, the Nisqually People (People of the River, People of the Grass) and held within the territories of the Nisqually Nation, near Olympia, Washington  – the 17th Protecting Mother Earth (PME) Conference from June 28 to July 1, 2018 gathered indigenous nation representatives from around the world. One and a half thousand indigenous Peoples, leaders, activists, youth, partners and allies joined together to learn and build relationships. Indigenous-initiated, designed and led, the conference intended to share voices from the frontline battles against environmental injustice and climate change. The conference was held at Frank’s Landing, an empowering location due to hero Billy Frank standing up for his tribe’s treaty and fishing rights, and as a result being arrested over 70 times throughout his life. I attended the PME Conference and came away with a new understanding and deep appreciation for the work and struggle of indigenous people worldwide. I heard the stories of indigenous peoples and allies from across the globe; from the United States to Canada, to Brazil and Ecuador, to New Zealand and France. In North Dakota, the Standing Rock Sioux tribe continue their struggle to protect water and culture. Both the U.N. Special Rapporteur on the rights of indigenous peoples and the U.N. 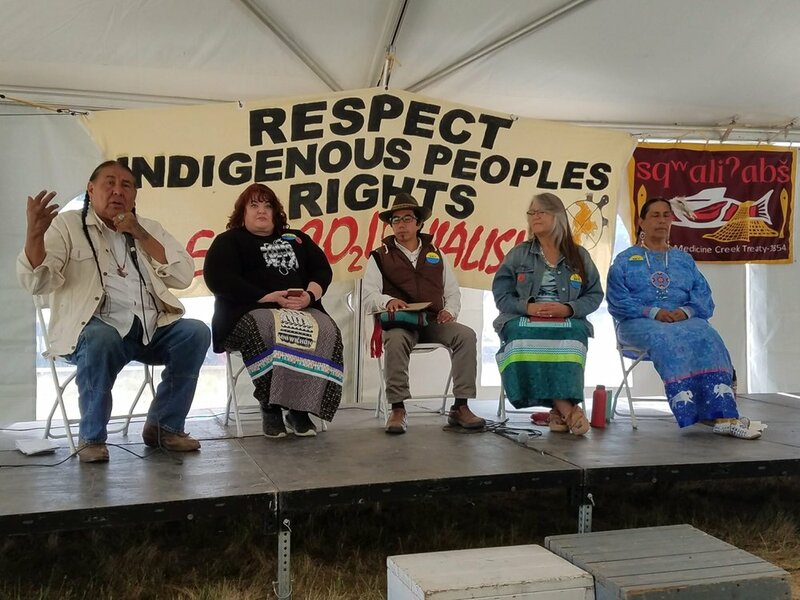 Permanent Forum on Indigenous Issues condemned the U.S.’s failure to adequately consult the Standing Rock Sioux Tribe. The Apurina nation, along with many others, work to stave off logging in the Brazilian Amazonian rainforest,  in a country that has lost an estimated 20% of its forest already. Ecuador representatives also spoke on the threats from logging, agriculture and false solutions to climate change (REDD). The ancestral lands of the Otomí Indians of Xochicuautla, Mexico is threatened by development projects, such as mega-highways, and they face human rights abuses such as assault and unjust detainment. The conference contained deep sessions on indigenous peoples struggles to protect their rights and Mother Earth from exploitation and extraction, while promoting a “just transition” to a sustainable and renewable society. Though these cultures live thousands of miles away from each other, their stories and struggles stem from the same causes and seek a unifying outcome: environmental justice. It was truly an honor to be surrounded by such strong, courageous, passionate and influential people- to hear their stories firsthand, feel the emotion, and stand in solidarity. I left the conference more empowered to fulfill the mission of Earth Law Center- to recognize and protect the rights of nature- and to do so alongside our indigenous allies. “Powerful relationships were built and strengthened which will extend beyond the conference grounds. In fact, as you read this, Indigenous communities from across the globe are working in unity to mobilize for the Global Climate Action Summit in California where Governor Jerry Brown and corporations will promote and celebrate false climate solutions that further exploit and violate Indigenous Rights.” Indigenous Climate Action, co-host of PME conference. Once numbering 13,500 indigenous nations around the world, there are now 5,000 different cultures- approximately 370 million people. Those that remain face ever increasing threats to their natural environments. At the forefront of the threats are extractive industries: timber and logging, gas and oil, and mineral mining. These industries not only threaten the land, water and air, but indigenous peoples’ livelihoods and cultures. In Earth Law Center’s 2017 update report on co-violations of human rights and nature’s rights, 30 percent of examined cases involved harm to indigenous peoples’ rights, despite their comprising only five percent of the world’s population. Such rights violations include acts of violence, including cases of murder, health effects through contaminated water and land, and “land-grabbing,” taking land without their consent. We remember the case of Billy Frank and the Nisqually tribe, who were told they no longer had rights to fish along the Nisqually River, just as they had done for generations. Indigenous people worldwide are at the forefront of standing up and defending the Earth. In the traditions of many indigenous peoples, everything is rooted in their original instructions, or cosmovision. Everything is connected and we are all related. It is our responsibility as humans to live in harmony with Mother Earth, because she is the reason for our being. She is our air, our water, our food and our shelter. One of the plenaries at the conference was on the rights of nature. I took particular interest in this discussion because of Earth Law Center’s work to promote the rights of nature. For indigenous peoples, rights of nature is almost a unnecessary concept, because for them, the laws of mother earth, and the connectedness and dependency of every being, is simple knowledge. Nature has always been our “source” not a “resource.” Nature has always had rights and always will. So, they ask, why do we need this new system of law that tells us what they already know? Another indigenous leader in the rights of nature movement, Casey Camp Horinek, similarly noted that rights of nature is not recognizing something new, but what has always been and that “you cannot separate nature’s rights and indigenous people.” What I gained from this is that you cannot have one without the other. As we move forward in this movement, it is important to keep this in mind as we draft new laws. If we are going to draft new laws recognizing the rights of nature, we must also include the rights of indigenous peoples. In 2013, the Tūhoe people and the New Zealand government agreed upon the Te Urewera Act, giving the Te Urewera National Park “all the rights, powers, duties, and liabilities of a legal person.” A Board was then established to serve as “guardians” of Te Urewera and to protect its interests. The stated purpose of the Act was to protect Te Urewera “for its intrinsic worth,” including its biodiversity and indigenous ecological systems. 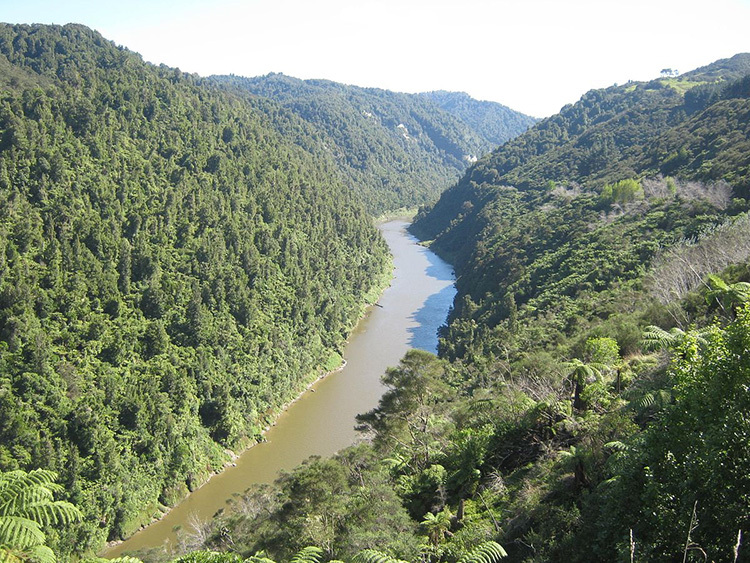 Similarly, the Maori people have successfully pursued similar results for the Whanganui River and its tributaries, under the Maori worldview “I am the River and the River is me.” Under the Tutohu Whakatupua Treaty Agreement, the river is given legal status under the name Te Awa Tupua. Te Awa Tupua is recognized as “an indivisible and living whole” and “declared to be a legal person.” Two guardians, one from the Crown and one from a Whanganui River iwi (tribe), will be given the role of protecting the river. In early 2018, with the help of ELC partners Movement Rights, the Ponca Nation of Oklahoma became the first tribe in the United States to pass a resolution recognizing the rights of nature. Largely in response to fracking and the exponential increase in earthquakes (almost 500 in 2017 alone), the Ponca Nation is taking a stand for their rights and the rights of Mother Earth. One key difference between this resolution and others around the world, is that the Ponca Nation included their right to take arbitrators to their tribal court, not state or federal court. This enables the tribe to more effectively protect their rights and that of their land. The Teyuna, the Arhuaco, Kankuamo, Kogi, and Wiwa peoples of the Sierra Nevada de Santa Marta region of Colombia, number approximately 40,000. Over a dozen Teyuna nation leaders will embark on their first-ever tour of the U.S. spanning over 9,400 miles and 40 locations in 16 states from July 10 through September 14, 2018. “The Teyuna call their home ‘The Heart of the World’. If there’s paradise at the end of the rainbow, they live in it. Nature responds to them. They’re coming to the US because time is running out for denizens of this land to take a more active roll in nurturing and caring for Planet Earth. The Teyuna plan to inspire them to do so. Those born to earth stewardship, specifically the indigenous nations of the US, comprise less then 2% of the population. The Teyuna plan to support them in the selfless service they’ve been providing for thousands of years.” says Mary Gaetjens, Teyuna Foundation President. As experienced front and center at the PME conference, indigenous peoples worldwide are leading the charge against environmental destruction. Earth Law and Rights of Nature is proving a useful tool to empower local communities and Indigenous leaders and Nations so that they may successfully steward and protect the ecosystems and species with which they live. Earth Law Center helps drive the global movement to stepping up protection of our natural environment by providing legal expertise to help evolve environmental law.